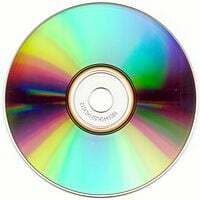 A Compact Disc or CD is an optical disc used to store digital data, originally developed for storing digital audio. The CD, available on the market since late 1982, remains the standard physical medium for commercial audio recordings as of 2007. Standard CDs have a diameter of 120 millimeters (mm) and can hold approximately 80 minutes of audio, depending on the format of the recorded songs. There are also 80 mm discs, sometimes used for CD singles, which hold approximately 20 minutes of audio. 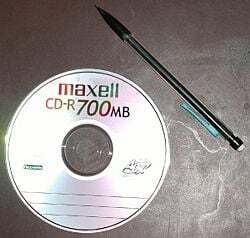 Compact Disc technology was later adapted for use as a data storage device, known as a CD-ROM, and to include record-once and re-writable media (CD-R and CD-RW). CD-ROMs and CD-Rs remain widely used technologies in the personal-computer industry as of 2007. The CD and its extensions have been extremely successful: In 2004, the annual worldwide sales of CD-Audio, CD-ROM, and CD-R reached about 30 billion discs. In 1979, Philips and Sony set up a joint task force of engineers to design the new digital audio disc. Prominent members of the task force were Joop Sinjou, Kees Immink, and Toshi tada Doi. After a year of experimentation and discussion, the task force produced the "Red Book," the Compact Disc standard. Philips contributed the general manufacturing process, based on video LaserDisc technology. Philips also contributed the Eight-to-Fourteen Modulation (EFM), which offers both a long playing time and a high resilience against disc handling damage such as scratches and fingerprints, while Sony contributed the error-correction method, CIRC. The Compact Disc Story, told by a former member of the task force, gives background information on the many technical decisions made, including the choice of the sampling frequency, playing time, and disc diameter. According to Philips, the Compact Disc was thus "invented collectively by a large group of people working as a team.". The Compact Disc reached the market in late 1982 in Asia, and early the following year in the United States and other markets. The first CDs available were 16 Japanese-made titles from CBS/Sony. This event is often seen as the "Big Bang" of the digital audio revolution. The new audio disc was enthusiastically received, especially in the early-adopting classical music and audiophile communities and its handling quality received particular praise. As the price of players sank rapidly, the CD began to gain popularity in the larger popular and rock music markets. The CD was originally thought of as an evolution of the gramophone record, rather than primarily as a data storage medium. Only later did the concept of an "audio file" arise, and the generalizing of this to any data file. From its origins as a music format, Compact Disc has grown to encompass other applications. 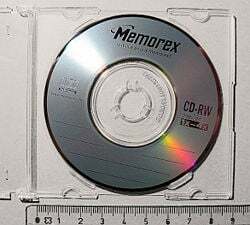 In June 1985, the CD-ROM (read-only memory) and, in 1990, CD-Recordable were introduced, also developed by Sony and Philips. The optical lens of a CD drive. A Compact Disc is made from a 1.2 mm thick disc of almost pure polycarbonate plastic and weighs approximately 16 grams. A thin layer of Super Purity Aluminum (or rarely gold, used for its data longevity, such as in some limited-edition audiophile CDs) is applied to the surface to make it reflective, and is protected by a film of lacquer. The lacquer is normally printed directly and not with an adhesive label. Common printing methods for compact discs are screen-printing and offset printing. CD data is stored as a series of tiny indentations (pits), encoded in a tightly packed spiral track molded into the top of the polycarbonate layer. The areas between pits are known as "lands." Each pit is approximately 100 nanometers (nm) deep by 500 nm wide, and varies from 850 nm to 3500 nm in length. The spacing between the tracks, called the pitch, is 1.6 micrometers (μm). A CD is read by focusing a 780 nm wavelength semiconductor laser through the bottom of the polycarbonate layer. The difference in height between pits and lands leads to a phase difference between the light reflected from a pit and that from its surrounding land. By measuring the intensity with a photodiode, it is possible to read the data from the disc. The pits and lands themselves do not directly represent the zeros and ones of binary data. Instead, "Non-return-to-zero, inverted" encoding is used: A change from pit to land or land to pit indicates a one, while no change indicates a zero. This in turn is decoded by reversing the Eight-to-Fourteen Modulation used in mastering the disc, and then reversing the Cross-Interleaved Reed-Solomon Coding, finally revealing the raw data stored on the disc. Pits are much closer to the label side of a disc so that defects and dirt on the clear side can be out of focus during playback. Discs consequently suffer more damage because of defects such as scratches on the label side, whereas clear-side scratches can be repaired by refilling them with plastic of similar index of refraction, or by polishing. A Mini-CD is 8 centimeters in diameter. The digital data on a CD begins at the center of the disc and proceeds outwards to the edge, which allows adaptation to the different size formats available. Standard CDs are available in two sizes. By far the most common is 120 mm in diameter, with a 74 or 80-minute audio capacity and a 650 or 700 MiB data capacity. 80 mm discs ("Mini CDs") were originally designed for CD singles and can hold up to 21 minutes of music or 184 MiB of data but never really became popular. Today nearly all singles are released on 120-mm CDs, called Maxi singles. The technical format of an audio compact disc (Compact Disc Digital Audio—CDDA) is laid down in a document produced in 1980, by the format's joint creators, Sony and Philips. The document is known colloquially as the "Red Book," after the color of its cover. The format is a two-channel, 16-bit PCM encoding at a 44.1 kHz sampling rate. Four-channel sound is an allowed option within the Red Book format, but has never been implemented. An audio CD consists of one or more stereo tracks stored using 16-bit Pulse-code modulation (PCM) coding at a sampling rate of 44.1 kilohertz (kHz). The sampling rate of 44.1 kHz is inherited from a method of converting digital audio into an analog video signal for storage on video tape, which was the most affordable way to get the data from the recording studio to the CD manufacturer at the time the CD specification was being developed. A device that turns an analog audio signal into PCM audio, which in turn is changed into an analog video signal, is called a PCM adaptor. This technology could store six samples (three samples per each stereo channel) in a single horizontal line. A standard NTSC video signal has 245 usable lines per field, and 59.94 fields/s, which works out at 44,056 samples/s/stereo channel. Similarly, PAL has 294 lines and 50 fields, which gives 44,100 samples/s/stereo channel. This system could either store 14-bit samples with some error correction, or 16-bit samples with almost no error correction. There was a long debate over whether to use 14- or 16-bit samples, and 44,056 or 44,100 samples, when the Sony/Philips task force designed the Compact Disc; Philips had already developed a 14 bit D/A converter, but Sony insisted on 16 bit. In the end, 16 bits and 44.1 kilosamples per second prevailed. Philips found a way to produce 16-bit quality using their 14-bit DAC by using four times oversampling. The original target storage capacity for a CD was an hour of audio content, and a disc diameter of 115 mm was sufficient to meet this target. According to Philips, Sony vice-president Norio Ohga suggested extending the capacity to 74 minutes to accommodate a complete performance of Beethoven’s 9th Symphony; but Kees Immink of Philips denies this. According to a Sunday Tribune interview, the story is slightly more involved. At that time (1979), Philips owned Polygram, one of the world’s largest distributors of music. Polygram had set up a large experimental CD disc plant in Hanover, Germany, which could produce huge amounts of CDs having, of course, a diameter of 11.5 cm. Sony did not yet have such a facility. If Sony had agreed on the 11.5 cm disc, Philips would have had a significant competitive edge in the market. Sony was aware of that, did not like it, and something had to be done. The long-playing time of Beethoven's Ninth imposed by Ohga was used to push Philips to accept 12 cm, so that Philips’ Polygram lost its edge on disc fabrication. The 74-minute playing time of a CD, being more than that of most long-playing vinyl albums, was often used to the CD’s advantage during the early years, when CDs and LPs vied for commercial sales. CDs would often be released with one or more bonus tracks, enticing consumers to buy the CD for the extra material. However, attempts to combine double LPs onto one CD occasionally resulted in an opposing situation in which the CD would actually offer fewer tracks than the LP equivalent. An example is the 1987 album, Kiss Me, Kiss Me, Kiss Me, by The Cure, which states in the CD liner notes: "The track 'Hey You!!!' which appears on the double album and cassette has been omitted so as to facilitate a single compact disc." Another example is the original late-1980s Warner Bros. Records reissue of Fleetwood Mac's Tusk album, which substituted the long album version of "Sara" with the shorter single version. Enough complaints were lodged to eventually convince Warner Bros. to remaster the album in the mid-1990s with the original contents intact. The program area is 86.05 cm² and the length of the recordable spiral is approximately 86.05 cm² / 1.6 μm = 5.38 km. With a scanning speed of 1.2 m/s, the playing time is 74 minutes, or around 650 MB of data on a CD-ROM. If the disc diameter were only 115 mm, the maximum playing time would have been 68 minutes; that is, six minutes less. A disc with data packed slightly more densely is tolerated by most players (though some old ones fail). Using a linear velocity of 1.2 m/s and a track pitch of 1.5 μm leads to a playing time of 80 minutes, or a capacity of 700 MB. Even higher capacities on non-standard discs (up to 99 minutes) are available at least as recordables, but generally the tighter the tracks are squeezed, the worse the compatibility. The smallest entity in the CD audio format is called a frame. A frame can accommodate six complete 16-bit stereo samples; that is, 2×2×6 = 24 bytes. A frame comprises 33 bytes, of which 24 are audio bytes (six full stereo samples), eight CIRC-generated error correction bytes, and one subcode byte. The eight bits of a subcode byte are available for control and display. Under Eight-to-Fourteen Modulation (EFM) rules, each data/audio byte is translated into 14-bit EFM words, which alternate with 3-bit merging words. In total that makes 33*(14+3) = 561 bits. A 27-bit unique synchronization word is added, so that the number of bits in a frame totals 588. The synchronization word cannot occur in the normal bit stream, and can thus be used to identify the beginning of a frame. Data on a CD-ROM are organized in both frames and sectors, where a CD-ROM sector contains 98 frames, and holds 98×24 = 2352 (user) bytes, of which 304 bytes are normally used for sector IDs and an additional layer of error correction, leaving 2048 bytes for payload data. Current manufacturing processes allow an audio CD to contain up to 77-78 minutes (variable from one replication plant to another) without requiring the content creator to sign a waiver. Thus, in current practice, maximum CD playing time has crept higher while maintaining acceptable standards of reliability. For its first few years of existence, the compact disc was purely an audio format. However, in 1985, the Yellow Book CD-ROM standard was established by Sony and Philips, which defined a non-volatile optical data computer data storage medium using the same physical format as audio compact discs, readable by a computer with a CD-ROM (CDR) drive. Replicated CDs are mass-produced initially using a hydraulic press. Small granules of raw plastic are fed into the barrel while under heat and increasing amount of pressure melt the plastic and force the liquified material into the mold cavity. Equipped with a metal stamper the mold closes, allowing the plastic to cool and harden. Once opened, the disc substrate is removed from the mold by a robotic arm, and a 15 mm diameter center hole (called a stacking ring) is removed. This method produces the clear plastic blank part of the disc. After the metallic layer is applied to the clear blank substrate the disc is ready to go to press. To press the CD first a glass master is cut using a high-power laser on a device similar to a CD writer. This glass master is a positive master. After testing it is used to make a die by pressing it against a metal disc. The die then becomes a negative image: A number of them can be made depending on the number of pressing mills that are to be running off copies of the final CD. The die then goes into the press and the image is pressed onto the blank CD leaving a final positive image on the disc. A small circle of varnish is then applied as a ring around the centre of the disc and a fast spin spreads it evenly over the surface. The disc can then be printed and packed. Recordable compact discs, CD-Rs, are injection molded with a "blank" data spiral. A photosensitive dye is then applied, after which the discs are metalized and lacquer coated. The write laser of the CD recorder changes the color of the dye to allow the read laser of a standard CD player to see the data as it would an injection molded compact disc. The resulting discs can be read by most CD-ROM drives and played in most audio CD players. CD-R recordings are designed to be permanent. Over time, the dye's physical characteristics may change, however, causing read errors and data loss until the reading device cannot recover with error correction methods. The design life is from 20 to 100 years depending on the quality of the discs, the quality of the writing drive, and storage conditions. However, testing has demonstrated such degradation in as little as 18 months under ideal storage conditions. CD-RW is a re-recordable medium that uses a metallic alloy instead of a dye. The write laser in this case is used to heat and alter the properties (amorphous vs. crystalline) of the alloy, and hence change its reflectivity. A CD-RW does not have as great a difference in reflectivity as a pressed CD or a CD-R, and so many CD audio players cannot read CD-RW discs, although most stand-alone DVD players can. CD-Rs follow the Orange Book standard. The Red Book audio specification, except for a simple "anti-copy" bit in the subcode, does not include any serious copy protection mechanism. Starting in early 2002, attempts were made by record companies to market "copy-protected" non-standard compact discs, which cannot be ripped (copied) to hard drives or easily converted to MP3s. One major drawback to these copy-protected discs is that most will not play on computer CD-ROM drives, as well as some standalone CD players that use CD-ROM mechanisms. Philips has stated that such discs are not permitted to bear the trademarked Compact Disc Digital Audio logo because they violate the Red Book specification. Moreover, there has been great public outcry over copy-protected discs because many see it as a threat to fair use. Numerous copy-protection systems have been countered by readily-available, often free, software. Also, any CD that can play on a standard audio CD player can be extracted via the standard S/PDIF digital output, rendering any copy protection ineffective. ↑ Kees A. Schouhamer, The CD Story. Retrieved October 27, 2007. ↑ Koninklijke Philips Electronics N.V., The Inventor of the CD. Retrieved October 27, 2007. ↑ Philips, Beethoven's Ninth Symphony of greater importance than technology. Retrieved October 27, 2007. ↑ Jerome L. Hartke, Measures of CD-R Longevity. Retrieved November 4, 2007. This page was last modified on 15 March 2017, at 14:54.